Profiles in Leadership is a Better Care Weekly feature that provides insight into the bright minds of leaders in the global veterinary healthcare community. Dr. Minteer is the Arizona Zoological Society Endowed Chair at Arizona State University (ASU). He’s a professor of environmental ethics and conservation in the School of Life Sciences at ASU and a Fellow at the Center for Humans and Nature in Chicago. Dr. Minteer writes about species extinction, wilderness, zoos, and the evolution of American environmental thought and practice. He teaches a set of undergraduate and graduate courses in environmental ethics and the history and philosophy of conservation. Dr. Minteer earned a Ph.D. in Natural Resources (Human Dimensions), University of Vermont, 2000; an M.S. in Natural Resource Planning (specialization in environmental ethics), University of Vermont, 1996; and a B.A. in Anthropology, University at Albany, SUNY, 1991. NAVC: We became intrigued by your work after reading about your new book “The Ark and Beyond: The Evolution of Zoo and Aquarium Conservation”. You and your team brought together four dozen authors that collectively traced the history of zoos and aquariums and investigated their potential role as conservation organizations. What are the primary challenges and opportunities that zoos and aquariums face if they make biodiversity conservation a top priority? Dr. Minteer: Zoos and aquariums are really trying to deepen and expand their conservation programs, including direct efforts (e.g., breeding and reintroduction of species to the wild) and via their education programs. Although there remains a healthy debate about what zoos can and should do as conservation organizations, it’s clear that they have the potential to engage more strategically with field-based conservation efforts, as well as with local communities around the world. Many of the leading zoos and aquariums are already doing this, of course, but there is an argument (both in our book and elsewhere) to do a lot more. Not surprisingly, there is a difficult economic aspect to all of this, and that is probably the biggest challenge confronting zoos as they try to grow their conservation programs. Most zoos only devote a small percentage of their operating budget to conservation and the community is often carried by the work of some of the larger and best equipped facilities, such as the San Diego Zoo and Bronx Zoo. 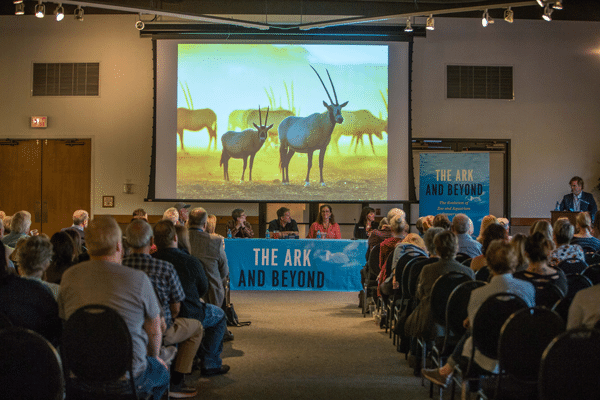 Many of the contributors to “The Ark and Beyond,” including leaders within the zoo and aquarium world, call for the zoo community to make more significant investments in the coming years. We will see how this plays out but I’m optimistic about the trajectory so far. NAVC: Were you interested at an early age in protecting the environment? Do you remember when you decided to make this the DNA of your research and teaching? Dr. Minteer: I actually wanted to be an anthropologist – I have an undergraduate degree in anthropology and did some graduate work in the field. As the years went by, my interests in anthropology started to gel around human-environment interactions, conservation, and so on, which turned me toward environmental studies and especially, toward environmental ethics. It all makes sense to me in hindsight, though I’m sure my parents were scratching their heads at the time wondering where all this was headed. NAVC: Does the role of ethics in conservation and environmentalism seem to resonate with your students? Sometimes we fear that ethics may seem to be an old-fashioned concept. Dr. Minteer: It does resonate — more now than ever, in fact. As a field of study, environmental ethics is still pretty young; it’s been around since the early 1970s though it often isn’t as visible as other areas of applied ethics such as biomedical ethics. But I’ve found that my students, especially at the undergraduate level, are really interested in the ethical aspects of how we relate to animals and other species, and to the natural world as a whole. The recent rise of “sustainability” as a pressing social and environmental concern has played a major role in spurring this interest. NAVC: Many of us mourned recently when Sudan, the last northern white rhino died. After their subspecies was declared extinct in the wild, Sudan and three others were relocated to a conservancy with hopes that a breeding program would be more successful in a more “natural” environment. It was not. We need some good news. Are there examples of some happy endings of species that were close to extinction and now are recovering? What can an average concerned citizen do to help? Dr. Minteer: There’s a lot of good news out there, though it’s often hard to cut through the gloom, especially when it comes to something like the global extinction crisis. But you can look to a number of species recovery efforts over the past fifty years or so and see more than a few bright spots. The Arabian oryx, the California condor, the black-footed ferret; all were on the brink of extinction but were saved due to the heroic efforts of many people and institutions (including zoos in all three cases). Much of the most important work is happening at the local community level, so there are all sorts of opportunities to get involved in something you care about, whether that’s raptor recovery or river restoration. There is always something to do, a group that could use your support, or a message that could be carried to broader and more diverse audiences. NAVC: Most people are quite concerned about the role of humans in harming our environment. We only know the tip of the iceberg about the serious problems conservationists deal with. You’ve devoted much of your career to these issues. What do you do when you get discouraged about the enormity of the problems? What advice do you have for us about how we can become better educated about the issues? Dr. Minteer: That’s a tough one. It’s easy to get discouraged given the number and scope of the problems, from species extinctions to wilderness destruction to climate change. I’m not sure I have an antidote to despair but I can tell you that I find some solace in history. We often like to think that our problems are something new under the sun and that we have no good way of grappling with them. That view leaves resignation as the only reasonable response. But of course that isn’t true – we’ve been working at these and related problems for quite some time and we can appreciate our hard-won victories (e.g., endangered species and special places saved from destruction). Clearly, our impacts have expanded and accelerated in recent decades and so the scale of concern has changed. We’re facing down more global-level challenges today than, say, a century ago. But we have a rich and deep tradition in American conservation and environmental thought, from Thoreau and Muir to Aldo Leopold and Rachel Carson, that I believe can still help us find our way, even though our 21st century world seems to be so different from theirs. I also think it’s important to remember that you don’t have to take on everything at once – that’s impossible. Focus on what is most meaningful to you, whether that is a single issue, e.g., local species or a place that needs attention, learn all you can about it, and then see how you can move the needle. NAVC: If the EPA would grant one thing that could make the biggest difference in the future of our planet and its inhabitants, what would that be? Is there a global group that could address that in other countries? Dr. Minteer: The EPA has been going through a distressing time of late so right now I would just wish for some calmer waters – and a renewed commitment to science and support for the vast expertise across the agency. Controlling greenhouse gas emissions is at the top of the list of consequential environmental actions, though more progress on that front is being made right now at the city and state level rather than at the federal level. Regardless, I think the desire to become more sustainable, both in terms of supporting our long-term human interests and the health and diversity of the landscape, is an overlapping goal that many of us can agree on. It should appeal to us whether we are ultimately motivated by bottom-line concerns or by an ethical regard for the diversity of life on the planet. What that means, though, is that we need to get better at seeing how our interests and actions have real consequences, and to reflect on the desirability of those consequences over the long run. Public opinion surveys about the environment always seem to report that a concern for future generations is widespread yet we seem to have a hard time acting on that concern. No agency or pronouncement or international body can do that for us. Caring is good, but we have to care enough to act. NAVC: As we did our research to interview you, your other books caught our attention. We’d like to let our readers know about them so the next few questions will focus on them. Could you provide a bit of information about why each is important and what your call to action is? Your most recent book, “Fall of the Wild”, is “a nuanced treatment of the deeper moral issues underpinning the quest to save species on the brink of extinction and an accessible intervention in debates over the principles and practice of nature conservation.” So the solution is not as “simple” as one would think? Dr. Minteer: It’s tricky. The book, which will appear at the end of this year, asks whether in the most extreme cases our aggressive efforts to save species also raise difficult questions about our impact on other environmental values we care about, such as the ideal of a wild nature beyond our control. The core of the book is a discussion of “de-extinction,” which is an attempt to use cutting-edge tools in genetic engineering and biology to “revive” extinct species such as the passenger pigeon and the Tasmanian tiger. It’s a controversial topic that’s drawn a lot of media attention in recent years. In “The Fall of the Wild,” I argue that de-extinction is a wrong turn for conservationists, and that we should not let our zeal to restore nature snuff out the restraint and humility that I believe should be the calling card for our conservation ethics. NAVC: In “The Landscape of Reform: A study of the pragmatic roots of American environmentalism”, you focus on the work and legacy of important conservation and planning thinkers, arguing that they blazed a significant “third way” in environmental ethics and practice. You explain that their efforts “to revitalize democratic citizenship by rediscovering the pragmatic roots of American environmentalism could bring about a new, civic-minded environmentalism.” Do you see evidence of this happening? Dr. Minteer: Not as much as I’d hoped when I wrote the book a dozen years ago. We seem to have become extremely polarized in our national politics, and we’re seeing this hyper-partisanship more and more at the state and local levels, too. Broad citizen-led conservation initiatives and movements have by no means disappeared; in fact, some are stronger and more active than ever. But our environmental politics are going through a time of change and reorganization. The punchline of that book was that there is a tradition in conservation and environmentalism that is more inclusive and civic-minded than the usual way of thinking about environmental politics, and that tradition is alive and well in a number of places today, from pragmatic efforts to “green” urban planning to the search for a more sustainable agriculture. I still believe that, even if our political moment has cast a shadow over some of these venerable ideals. NAVC: In “After Preservation”, you explain that “accelerating climate change, rapid urbanization, agricultural and industrial devastation, metastasizing fire regimes, and other quickening anthropogenic forces all attest to the same truth: the earth is now spinning through the age of humans.” You discuss the ways we have tried to both preserve and exploit nature and you ask: what is the role of preservationism in an era of seemingly unstoppable human development? What’s the primary takeaway from this book? Dr. Minteer: That book was a really interesting project for me. It was a collaboration with my ASU colleague Steve Pyne, who shared my interest in the “Anthropocene,” the idea that we have so influenced and altered the planet that we should name our current geological epoch the “age of humans.” When you think about that, it really raises some hard questions for the goal of “preserving” species and wilderness apart from human influence. Given the controversy surrounding this topic, Steve and I decided to gather together a thoughtful group of writers, including environmental journalists, biologists, philosophers, historians, and policy experts, and ask them to tell us what they thought the Anthropocene idea meant for nature preservation. The short answer to your question is that there isn’t a single takeaway from the book other than we all recognize that we are at an inflection point when it comes to preserving nature in the human age. As we write, the Anthropocene idea is kind of a Rorschach test for environmentalists. Some see in it the annihilation of nature, while others simply see a call to be smarter about how we manage ourselves on the planet and how we go about shaping nature to support us more efficiently. I think the back-and-forth is going to continue for some time, not least because we’ve been arguing about those ideas in general for more than a century. The Anthropocene is just the latest round in a long debate. NAVC: Tell us about the new program launched by Arizona State University’s School of Life Sciences and the Phoenix Zoo to strengthen animal conservation efforts by collaborating on new research and improving conservation communications and outreach to the public. What is your role in that initiative? 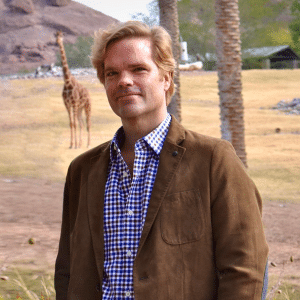 Dr. Minteer: About five years ago I was appointed the Arizona Zoological Society Endowed Chair at Arizona State University, a position originally established by the Robert Maytag family around the time it founded what is now the Phoenix Zoo. I was tasked with helping to build a conservation partnership with the Zoo and “The Ark and Beyond” project is the centerpiece of my first five years in the position. We held a great event at the Phoenix Zoo this spring to share the book with the public and our outreach efforts for this project are ongoing. In the School of Life Sciences we also continue to work with our colleagues at the Phoenix Zoo on a number of projects and initiatives, including undergraduate internship programs and other long-term collaborative research efforts. The Zoo has a proud legacy of conservation – it was a key player in the recovery of the Arabian oryx among other species – and its leadership is committed to deepening and expanding this mission. My chair position has recently been renewed for another five years so I’m really looking forward to our continuing collaborations and to moving my work into some new areas as I move forward. NAVC: What do you do for fun? Tell us about your pets and your family. Dr. Minteer: I’m a huge fan of jazz so I enjoy listening to it and reading about jazz history and culture (I played jazz bass in ensembles in high school and college so I guess it’s also a way of keeping that flame burning). My wife, Vanessa, is an attorney who works in the area of American Indian law. She specializes in cultural resource protection, a vitally important concern for tribes. We have an (almost) 4-year old daughter, Madeline, who is full of boundless energy and curiosity. Most days we just try to keep up with her – we’re usually only partly successful in that effort. We like to enjoy the Arizona outdoors as much as possible, though the summer months are pretty brutal when the temperature parks itself above 110 degrees. And we have an amazing pit bull rescue named Olive; she adores Madeline and is her best buddy. NAVC: Is there a favorite quotation or book that inspires you? Dr. Minteer: One of my favorite quotes comes from Thoreau in “Walden”: “Our village life would stagnate if it were not for the unexplored forests and meadows which surround it.” For literary, environmental, and personal inspiration, I often return to Peter Matthiessen’s “The Snow Leopard.” It’s just a beautiful book.